Miami is known for shopping, museums, zoos & aquariums, fun & games, and nightlife. 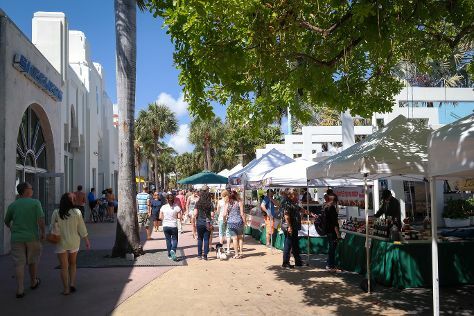 Your plan includes some of its best attractions: wander the streets of Lincoln Road, don't miss a visit to Bayside Marketplace, tour the pleasant surroundings at South Beach, and get to know the fascinating history of Art Deco Historic District. To find other places to visit, traveler tips, ratings, and more tourist information, read our Miami trip planning website . Boston to Miami is an approximately 5.5-hour flight. You can also do a combination of flight and bus; or drive. In June, Miami is a bit warmer than Boston - with highs of 89°F and lows of 77°F. Cap off your sightseeing on the 5th (Wed) early enough to travel to Springfield. Springfield is a city in western New England, and the seat of Hampden County, Massachusetts, United States. Get out of town with these interesting Springfield side-trips: Hill-Stead Museum (in Farmington), Elizabeth Park (in West Hartford) and New Britain Museum of American Art (in New Britain). And it doesn't end there: tour the pleasant surroundings at Stanley park, see the interesting displays at Basketball Hall of Fame, take in nature's colorful creations at Grandmother's Garden, and browse the exhibits of Springfield Armory National Historic Site. To find traveler tips, other places to visit, more things to do, and more tourist information, refer to the Springfield attractions website . You can do a combination of flight and train from Miami to Springfield in 7 hours. Other options are to do a combination of train and flight; or drive. While traveling from Miami, expect little chillier days and much colder nights in Springfield, ranging from highs of 78°F to lows of 54°F. Wrap up your sightseeing on the 8th (Sat) to allow time to drive back home.